The tightest division in the NFL could still go to any one of three teams. 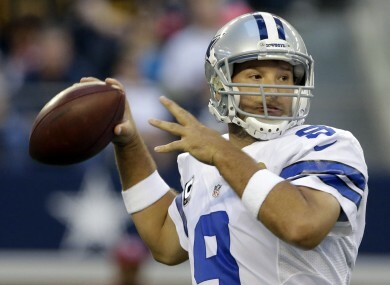 Tony Romo has been in better form of late. THE NFC EAST is perhaps the strangest division in all of football. At times this year, all four teams have looked like potential Super Bowl winners. Unfortunately, there have also been times when they’ve resembled the Oakland Raiders. Take the Eagles for example. They started the season beating the Ravens and Giants on their way to a 3-1 record. In the remaining ten games they have managed just one win, a last-gasp victory over the Tampa Bay Buccaneers in week 14, a run that has seen them fall out of playoff contention. The three remaining teams – the New York Giants, Washington Redskins and Dallas Cowboys – are locked on 8-6 and, while momentum is firmly with the Redskins, any one of them could make the postseason as divisional winners. The Dallas Cowboys have had to deal with quite a lot of on and off-field problems in recent weeks. Injuries to key defensive players and the death of Jerry Brown in an accident that resulted in fellow player Josh Brent being charged with ‘intoxication manslaughter’ haven’t had an impact on Dallas’ form as America’s team have strung together five wins in six games and hold their post-season destiny in the their own hands. The Saints aren’t out of the playoffs just yet and will look to take advantage of a weakened Cowboys’ defence, especially after their impressive 41-0 victory over the Bucs last weekend. Drew Brees has led the Saints to three wins in his last three games in Dallas and, while New Orleans may not make the post-season themselves, they certainly won’t be facilitating an easy ride for anyone else. A lot of people were confused when the Redskins drafted Kirk Cousins in the fourth round of this April’s NFL draft after they’d already used the second overall pick on RGIII. However, the rookie out of Michigan State has proven his worth over the last two weeks when he came off the bench to beat the Ravens before throwing for nearly 330 yards against the Browns last week. Whether or not Griffin returns this week, the ‘Skins are in safe hands in Cousins who has the benefit of the league’s best rush offence to rely on if the passing game doesn’t click. The Eagles rank just 20th against the run and aren’t much better on offence where they are currently relying on their second-string running back and quarter back. Eagles coach Andy Reid is unlikely to be asked to return to the city of brotherly love next season but he has a lot of friends in the league and it’s unlikely he’ll be out of a job for long, especially if a coaching vacancy opens up in San Diego. Verdict: Washington have won five in a row and everything points to them making it six and setting up a final week showdown with the Cowboys for the division. Redskins by 5. Of all the teams in the NFC East, including the Eagles, the Giants have probably had the most disappointing season. The defending Super Bowl champions have looked unstoppable at times and yet, too often, they fall asleep in games. Their run of just two wins from the last six has allowed both the Redskins and Cowboys to take control of the division. The Ravens, despite getting rid of offensive coach Cam Cameron, are still failing to get the ball into the hands of stud running back Ray Rice. The diminutive back carried the rock just 12 times for 38 yards in last week’s loss to the Broncos and the key for the Giants will be to score early to force the ball into the hands of the woeful Joe Flacco. Like the popularity of ‘Gangnam Style’, how they get the figs into Fig Rolls and why Donald Duck wears a towel after a shower when he doesn’t wear trousers anyway, Flacco’s ability to convince the Ravens organisation he is an NFL quality quarterback will remain one of life’s great mysteries. Verdict: Ravens are actually favourites for this which is strange considering they are on a three-game losing streak. Both teams really need a win to get any sort of momentum for the playoffs and, for me, it will be the Giants by less than 3. Email “The Redzone: Who will be left standing in the NFC East”. Feedback on “The Redzone: Who will be left standing in the NFC East”.